For me the cravings hit last night when I got home from work. I didn’t fancy the salad I had planned to eat but instead I was craving something slightly naughty, warm and comforting. I looked through the fridge and cupboards, to assess what could be made and when I spotted the Corn Tortilla Chips, Nachos immediately came to mind. I have used what I had in the fridge, so a few items could be swapped about but these recipes work really well as they. Chop up the tomatoes into small pieces. Destone, chop and mash the avocado (If you like chunky Guacamole, mash less). In one bowl mix together 300g of tomatoes, 1/2 onion, garlic, 2/3 chilli, coriander, 1/4 lemon juice in a bowl and a pinch of salt to make the Salsa. In another bowl mix together 35g cherry tomatoes (1 normal tomato), 1/2 onion, 1/3 chilli, 1/2 lemon juice, salt and pepper to make the Guacamole. Take two plates and place 1/2 the tortilla chips on each plate, 1/2 Guacamole, 1/2 Salsa and grated as much or as little cheese as you like on top (If vegan sprinkle over nutritional yeast). Place each plate in the microwave for 3-4 minutes until the cheese is melted. 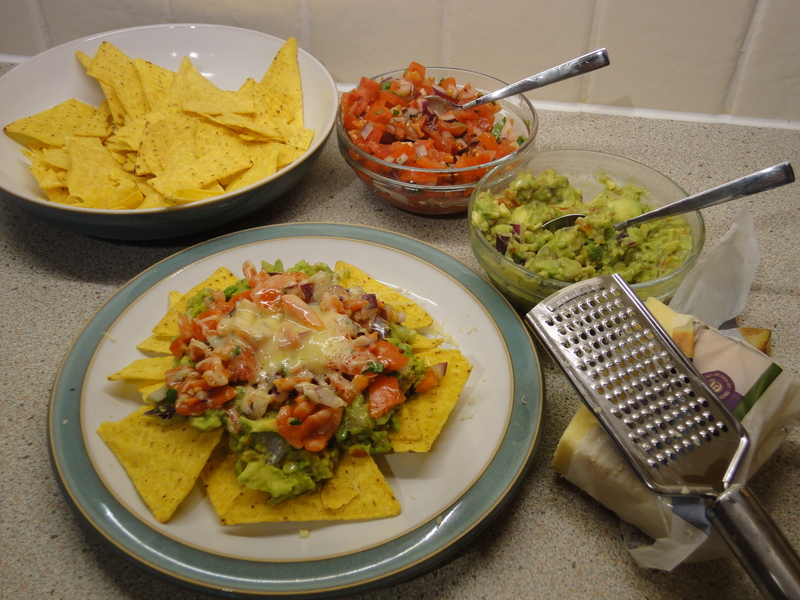 This entry was posted in Dinner, Snacks and tagged avocado, cheese, cherry tomato, chilli, coriander, cravings, garlic, gluten-free, glutenfree, guacamole, healthy, lemon, nachos, red onion, salsa, shedding the wheat, snack, tomato, vegan, vegetarian. Bookmark the permalink.